The mainstreaming of ads with gay couples, which really accelerated in 2014 thanks to brands like Honey Maid, continues into 2015—and now it's Hallmark's turn to join in. The greeting-card company is gay friendly—it's been making gay marriage cards since 2008. But it evoked some ire from the gay community in 2013 when it replaced the word "gay" with "fun" on a "Deck the Halls" Christmas ornament in 2013. 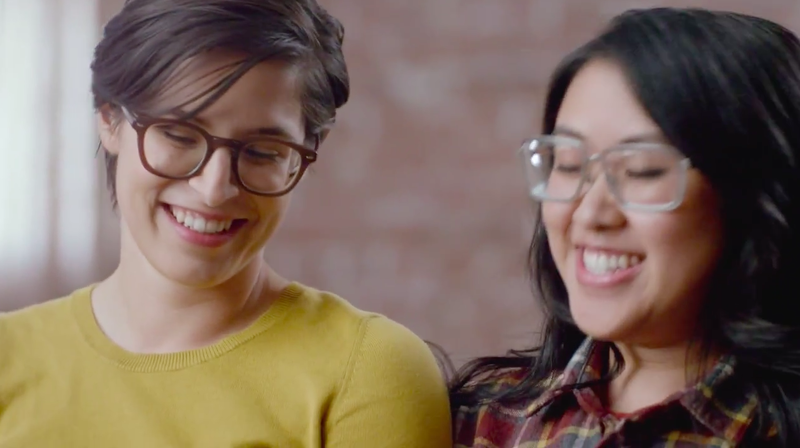 Also, it's one thing to sell gay-friendly merchandise—it's another to feature a gay couple in a commercial, as Hallmark has now done in its new "Put Your Heart to Paper" campaign for Valentine's Day. The campaign includes interviews with real couples, who talk about what they love about each other—and who are asked to describe their feelings for each other without using the word "love." Among those featured are the lesbian couple Eugenia and Corinna, who star in one of the campaign's cutest ads. "This makes me so very happy and proud to be a Hallmark employee, who is also gay, and who has been pushing our idea of expanded love identities forward for a long time," writes one YouTube commenter. "My heart is bursting, my eyes are spilling. Thank you for sharing your story with us, and your love with each other.﻿"
See more ads from the campaign below.